On March 19 the Royal Institute of British Architects (RIBA) became the first UK professional association to take action against Israel for its breaches of international law. 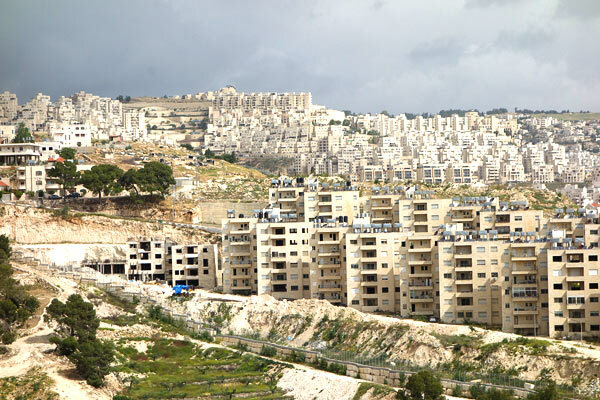 Its council passed a motion, proposed by former RIBA president Angela Brady and backed by Architects and Planners for Justice for Palestinians (APJP), calling on the International Union of Architects to suspend the Israeli association from membership, “until it acts to resist [these] illegal projects, and observes international law”. Full details can be found in a media statement from the APJP. Be in no doubt. The Royal Institute of British Architects (RIBA) is now officially antisemitic. On Wednesday, it voted to support a ban on Jews from joining the International Union of Architects. It didn’t put it quite like that, of course. The wording of its motion referred to ‘Israelis’ rather than ‘Jews’. But in singling out the Jewish state for opprobrium, over and above every other nation on earth, and in seeking to ban Jews — sorry, Israelis — from membership, the driving force behind both the BDS campaign and its RIBA conspirators is clear. Jew hatred lives on in RIBA. The Jewish chair of APJP, J-BIG supporter Abe Hayeem, is waiting to see if the JC will publish his letter in reply. Follow this link to read his presentation to the RIBA council, explaining in detail the complicity of Israel’s architects in pushing forward the illegal colonisation and settlement of Palestinian land. Today’s MORNING STAR (“The People’s Daily”) carried this feature about the foundation and work of Jews for Boycotting Israeli Goods. DEBORAH FINK and Naomi Wimborne-Idrissi are co-founders of Jews for Boycotting Israeli Goods (J-Big), a group which has scored major successes as progressive Jewish people respond to Israel’s treatment of Palestinians. The pair met through Jews for Justice for Palestinians (JfJfP), founded in February 2002 in response to the second intifada. Fink joined in July that year. Coming from a conservative, pro-Israel background, she found it reassuring to meet fellow Jews who were against Israel’s policy in Palestine. She sees JfJfP as an important organisation. “It shows the world that Israel does not represent all Jews, that it cannot count on all Jews for support,” she says. Anti-semitism is often the accusation thrown at Israel’s critics, with the aim of intimidating them into silence. Fink felt there needed to be a specifically Jewish voice supporting the campaign to boycott Israeli goods, so with Wimborne-Idrissi she founded J-Big in 2006. They chose the tongue-in-cheek slogan “it’s kosher to boycott Israeli goods,” highlighting the fact that many Jews are involved in the Boycott, Divestment and Sanctions (BDS) campaign, so it’s “kosher” to take part. Wimborne-Idrissi comes from a left-wing Jewish household. Her father used to sell the Morning Star’s predecessor the Daily Worker, so solidarity with oppressed peoples is something she grew up with. She discovered JfJfP in the run-up to the Iraq war in 2003. A speaker at a Stop the War demo was speaking, as a Jew, for Palestinian rights. Wimborne-Idrissi signed up there and then. She felt that JfJfP, while doing great work in the Jewish community, did not go as far as she and others wanted in the boycott campaign. A further step was needed. The Palestine Solidarity Campaign had set up a Boycott Israeli Goods campaign and was showing an interest in getting a specifically Jewish voice involved. Wimborne-Idrissi and Fink pulled together some like-minded people and set up J-Big. A founding statement was published, a banner sporting the “kosher” slogan produced and J-Big set about mobilising support. Wimborne-Idrissi says it wasn’t long before the expected deluge of venomous accusations flooded in. “We had no illusions that the campaign would bring the Israeli economy crashing down,” she says. J-Big became more interested in boycotting Israel at an institutional level — by, for example, boycotting cultural events such as when Israeli musicians come to Britain under the Israeli flag to perform here while Palestinian artists are suffering under the occupation. Here Fink’s musical training — she’s a bachelor of music and a trained soprano — came to the fore. Working with others in the BDS movement Fink debuted by interrupting the Jerusalem Quartet at the Wigmore Hall in 2010, singing a parody of Jerusalem, Holy City. 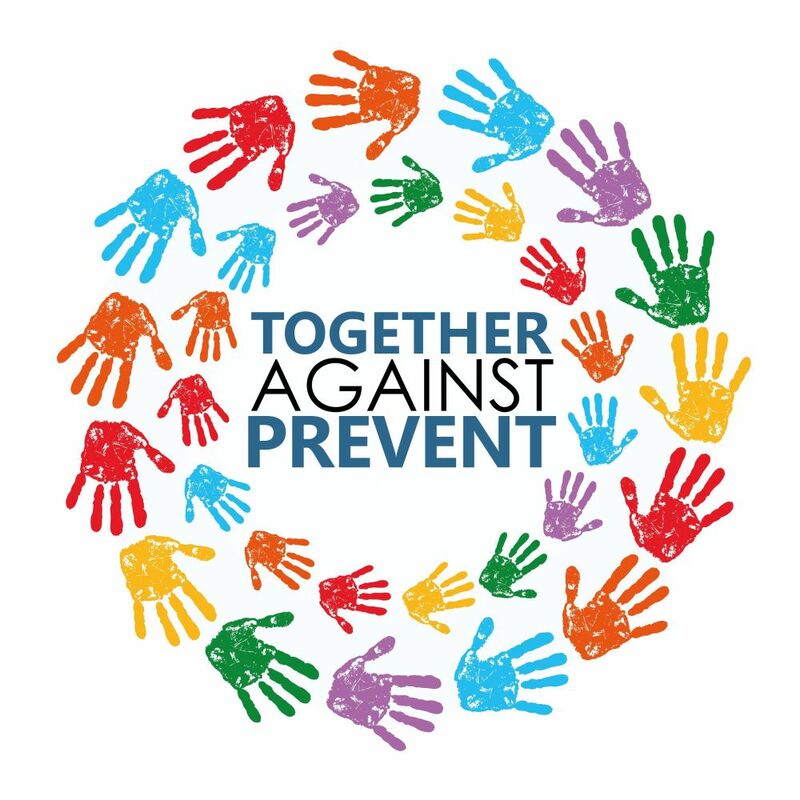 J-Big was involved when the campaign tackled a more high-profile target, encouraging as many as possible to join in the protests when the Israeli Philharmonic Orchestra played the Royal Albert Hall in 2011. There were many disruptions to the orchestra’s performance, the first of which involved 13 activists in a choir led by Fink. Protesters, who came from as far afield as Edinburgh and Brighton, were strategically seated around the auditorium and their interventions carefully timed. During a quiet musical passage protesters in vacant choral seats stood up with cloth banners which together spelled Free Palestine. The protesters were eventually escorted out of the hall, but the protest made global news. Fink explains the controversial action by pointing to the way the orchestra operated as a cultural ambassador, making Israel appear civilised. “As a musician I find it hard to disrupt beautiful music,” she says. “But basic human rights are more important. Wimborne-Idrissi adds that the protests were planned to disrupt the beauty of the music as little as possible. The Bruch violin concerto was part of the programme, for instance. So “free Palestine!” would be shouted when the conductor was raising his baton at the start of a piece, but not once the violin had started playing. The disruptions were done to be in keeping with the performance, turning it into a weapon for the Palestinians. The concert was not aborted. It was the BBC that cut the broadcast — which had never happened before in the history of the proms. It was an even more successful protest than the previous action at Wigmore Hall. I suggested that what this party of 30 or more people had done that night at the Albert Hall was not so much to disrupt Beethoven, who featured, but to be true to his spirit. Wimborne-Idrissi stresses that the global boycott movement, started by the Palestinians themselves, does not target individual Israelis — and certainly not Jews as Jews. It targets institutions and aims for equality for Palestinians living in Israel, freedom for Palestinians living in the occupied territories and justice for Palestinian refugees, including the right of return for all those forced to flee their homes since the Nakba (“catastrophe”) of 1948. Together, these movements hope to win justice for Palestinians — something the UN has signally failed to achieve. 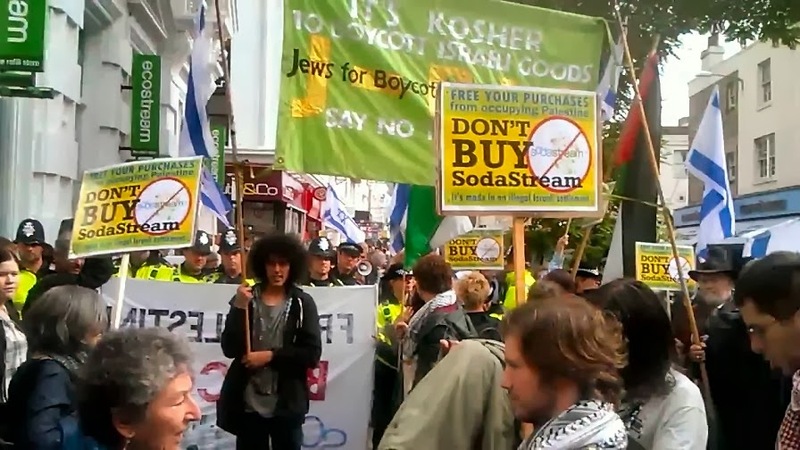 Saturday September 28 marked a national day of action to highlight the scandal of high street stores marketing Sodastream – fizzy drink-making products for the home produced by an Israeli company operating out of an illegal settlement on Palestinian land. There were protests in many cities around the UK. 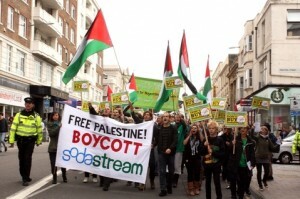 The green and gold Jews for Boycotting Israeli Goods banner was prominent on the demonstration in Brighton where Sodastream is promoted by the Israeli-owned Ecostream shop. J-BIG made a point of supporting the campaigners in Brighton and Hove who have steadfastedly maintained weekly protests since the Ecostream store opened just over a year ago. They have faced vicious attacks from Zionists, supported by the Brighton Argus newspaper in attacking them as anti-semites. One of those they have vilified is Jewish PSC member Terry Yason who addressed the protest on Saturday to put the record straight. Since Hillel Jews have consistently supported the underdog – at The Battle of Cable Street against the Fascists in Brick Lane, London in 1936 , in the International Brigades in Spain fighting Franco for the democratically elected Republican Government, in the Civil Rights Movement riding and dying with the Freedom Riders in Mississippi in the 60s and fighting in the ANC against Apartheid South Africa. We have an honourable history. But today the Government of the “Jewish State” of Israel defy Hillel in their inhumane treatment of the Palestinians. For the first time in Jewish history, to their shame, they have created their own Underdog. SodaStream, the parent of the Brighton shop Eco Stream, manufacture their products in a factory situated in the illegal settlement of MISHOR ADUMIN. In the Sodastream corporate video their CEO… claims they are one big happy family. Here is what one Palestinian worker says about working for Sodastream. Brighton and Hove Palestine Solidarity Campaign is a universal movement, made up of ordinary people of all colours, religions , politics, nationalities and back grounds. Together we oppose the savage treatment meted out to the Palestinians by the Israeli government. As a cornerstone of their propaganda , the Israeli Government continually label those who oppose her as anti Semitic. Today I am here as a Jew, with my Jewish and non Jewish comrades, to destroy once and for all that insidious claim , and to proclaim that Anti Zionism is a call not for the destruction of the State of Israel but for its emancipation . When we opposed Apartheid in South Africa the result was the Rainbow Nation. Like South Africa, Israel can become the democracy it so mistakenly calls itself, if it also abandons Apartheid. To make even more of a nonsense of their lies; today we are joined by members of the two national Jewish organisations, Jews for Justice for Palestinians and Jews for Boycotting Israeli Goods . We also have support from two Jewish artists who have sent these emails. Israel was created in my name, exclusively for Jews by Jews, and as a Jew I feel a special responsibility to protest at the racist actions of the Israeli government towards the Palestinians – their colonial land grab , the relentless building of settlements on Palestinian land, their diversion of priceless water to the settlements, the constant confiscation of Palestinian land , the thousands of Palestinians in Israeli jails and to the shooting by the IDF of Palestinian children. In their their relentless and murderous pursuit of a land devoid of Palestinians they destroy the dream of Hillel. Today I ask the Jews of the Diaspora to remember your history in supporting the underdog, and support us in withdrawing your support for Israeli Government policies towards the Palestinians. To all the people of Brighton and Hove I ask you to boycott the EcoStream shop , refuse to buy SodaStream products and send them packing out of our beautiful city . See also Tony Greenstein’s blog for a detailed report and more pictures. The following statement has been issued on behalf of violin maestro Nigel Kennedy in response to the BBC’s decision to censor a remark he made during a Prom concert with young Palestinian musicians on August 8 (see previous post for details). Will the BBC now have the courage to restore Kennedy’s comment to its rightful place in the TV broadcast of the concert on August 23? Will they continue with his scheduled appearance as one of the stars in the gala Last Night of the Proms on September 7? “Nigel Kennedy finds it incredible and quite frightening that in the 21st century it is still such an insurmountable problem to call things the way they are. He thinks that once we can all face issues for what they really are we can finally have a chance of finding solutions to problems such as human rights, equal rights and even, perhaps, free speech. His first reaction to the BBC’s censorship & imperial lack of impartiality was to refuse to play for an employer who is influenced by such dubious outside forces. Mr Kennedy has, however, reminded himself that his main purpose is to provide the audience with the best music he can deliver. To withdraw his services would be akin to a taxi driver refusing to drive their customer due to their political incorrectness. He, therefore, is not withdrawing his services that he owes to his audience, but is half expecting to be replaced by someone deemed more suitable than him due to their surplus of opportunism and career aspirations. Mr Kennedy is glad, however, that by censoring him the BBC has created such a huge platform for the discussion of its own impartiality, its respect (or lack of it) for free speech and for the discussion of the miserable apartheid forced on the Palestinian people by the Israeli government supported by so many governments from the outside world. No doubt under extreme pressure from the Zionist lobby, the Globe is imposing unprecedented security measures on audiences on Monday and Tuesday, in a misguided attempt to prevent protesters expressing their outrage at the presence of Habima, which entertains colonists illegally settled on Palestinian land. In moves that will make the theatre resemble an Israeli checkpoint, bags “and audience members” will be subjected to “extensive searches”; the audience will be required to check in an hour and a half before the start of the performance and no bags larger than a medium-sized purse will be allowed into the auditorium. Now evidence has emerged that the Israeli Embassy is instructing Israel’s supporters in the UK on how to use Twitter in Habima’s defence. In emails circulated to some sections of the Jewish community, the embassy is launching a Twitter campaign using “the hashtag #LoveCulture as it is short enough to fit on a substantial tweet and won’t be taken at first glance as a political statement” (our emphasis). 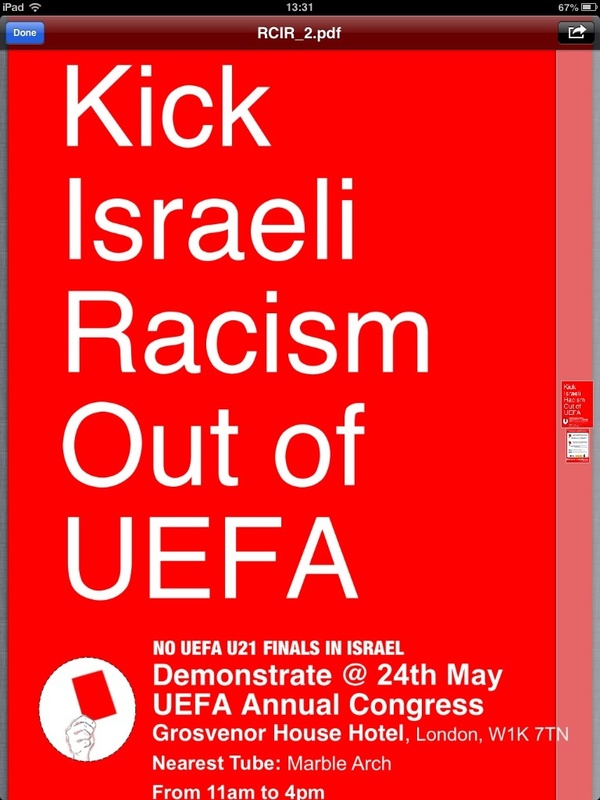 For those who, on the other hand, respect the Palestinian call for boycott, divestment and sanctions and recognise cultural boycott as a legitimate weapon in the non-violent struggle for freedom, justice and equality, we recommend joining a mass protest outside the Globe at 6pm on Monday May 28 and again on Tuesday 29th. The protest is a joint effort by the full range of Palestinian solidarity organisations including Jews for Justice for Palestinians, J-BIG, the Boycott Israel Network, PSC and many more. Film maker Ken Loach said in statement before the protests that Habima, in common with other Israeli cultural institutions travelling abroad, was part of Israel’s propaganda campaign. Despite appeals over recent months from Israeli campaigners and many respected UK theatre actors, directors and playwrights, the Globe has declined to respect the Palestinian boycott call aimed at institutions, like Habima, that use culture to legitimise the Israeli state’s infringements of human rights and breaches of international law. See actors David Calder, Miriam Margolyes and John Davies explaining their support for the cultural boycott of Israeli National Theatre, Habima. Join the campaign facebook page.